This is most northern of the provinces of Le Marche and covers an area of 2,564 km². 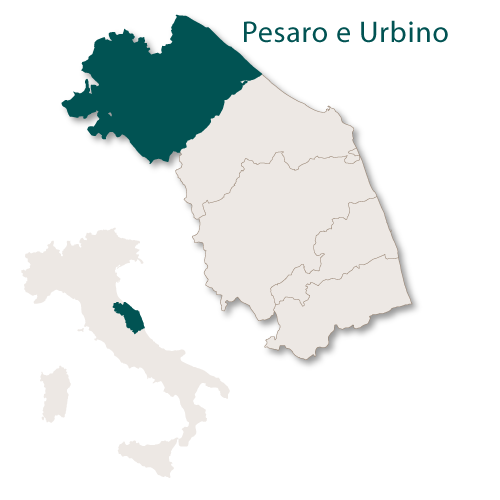 Pesaro e Urbino has the Adriatic Sea along its eastern border, Emilia Romagna to the north, the province of Ancona to the south and Umbria to the south west. The shoreline has long beaches of sand and stone, stretching across into gently sloping hills before arriving at rugged mountains. 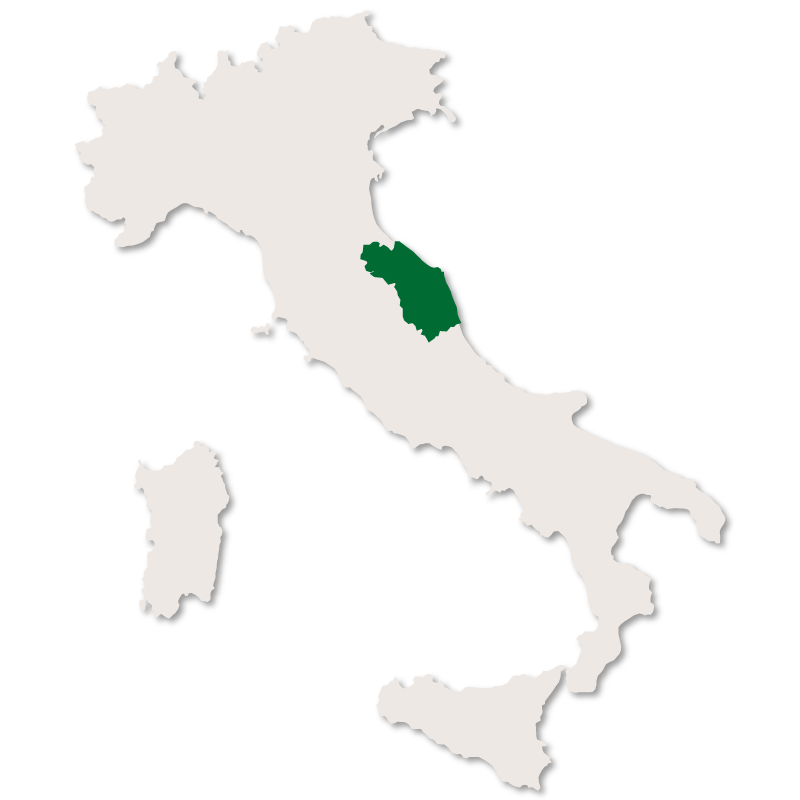 This province has two National Parks (Monti Sibillini and Gran Sasso e Monti della Laga), five Regional Parks (Monte Conero, Sasso Simone e Simoncello, Monte San Bartolo, Gole della Rossa e Frasassi) and five Nature Reserves (Abbadia di Fiastra, Gola del Furlo, Montagna di Torricchio, Ripa Bianca e Sentina) passing through it. The closest airport is in Ancona. 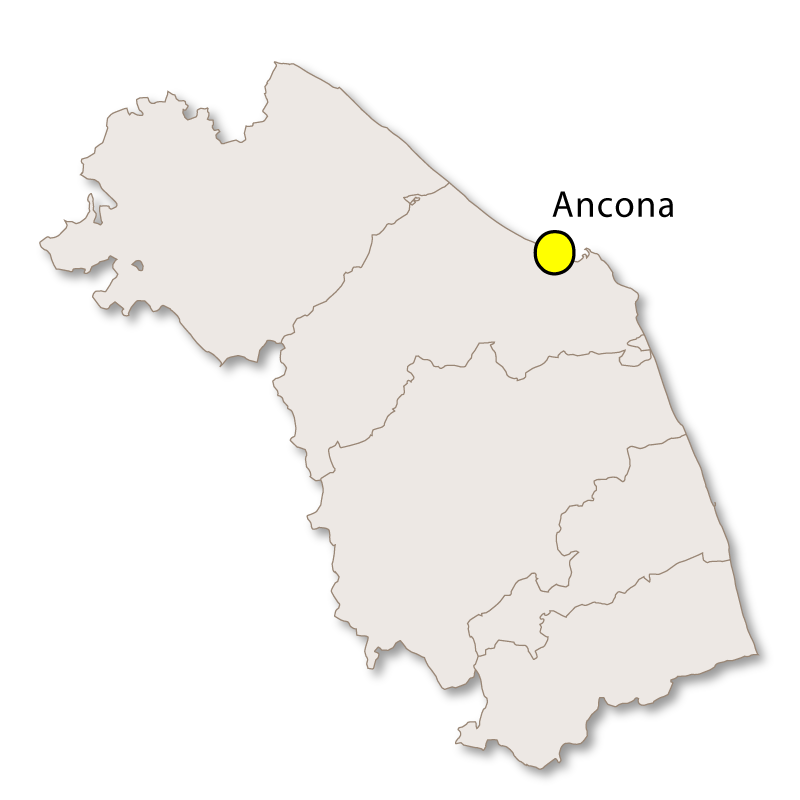 Aeroporto di Ancona-Falconara (AOI) is located in Falconara Marittima to the west of Ancona and is about 65 kilometers from the city of Pesaro. This airport is also known as Aeroporto Raffaello Sanzio. The nearest ferry port is Ancona which is just under 80 kilometers from the town of Pesaro. The port, one of the main ports on the Adriatic Sea, is located near the centre of Ancona and is a busy passenger port with ferries running to Greece, Turkey, Croatia, Albania and Montenegro. 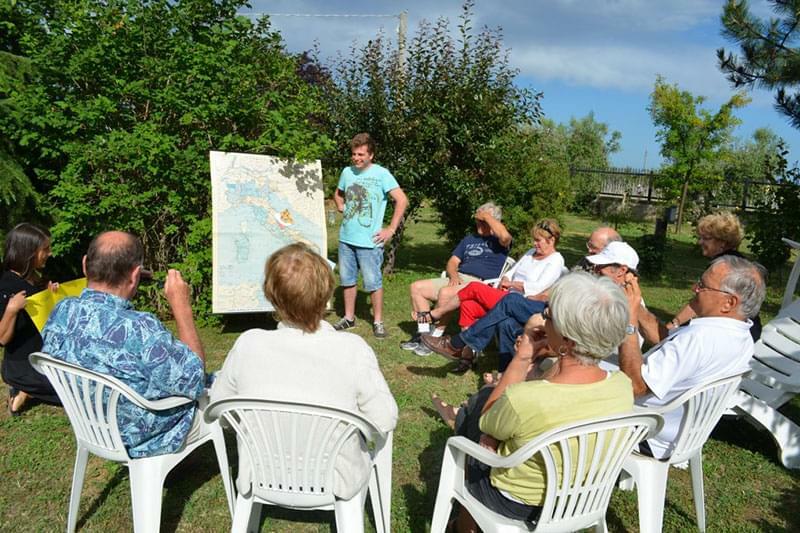 It has good facilities with a café, shop, restrooms and both short and long term car parks. 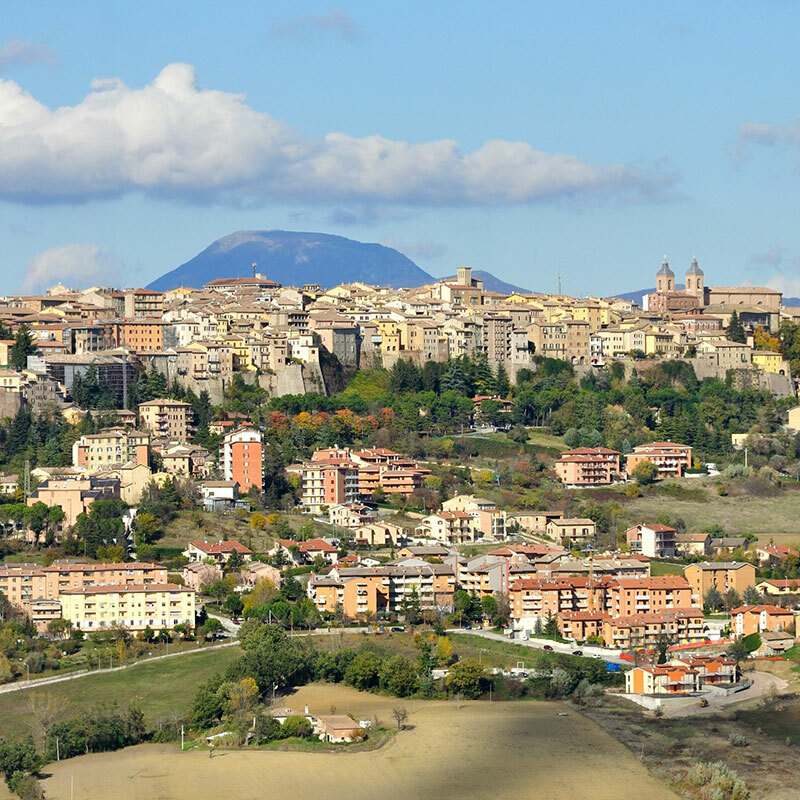 The main road serving Pesaro e Urbino, along with the rest of the region of Le Marche, is the A14 motorway (Autostrada A14 or Autostrada Adriatica).This motorway runs between the cities of Bologna and Taranto, mostly hugging the Adriatic coastline. The A14 motorway is 743.4 km in length and mainly consists of two lanes, three in parts of the north and has many hills, tunnels and bridges. Access to Rome is also easy from here by car and by train and both Pesaro and Fano are larger stations on the Bologna to Ancona mainline railway. 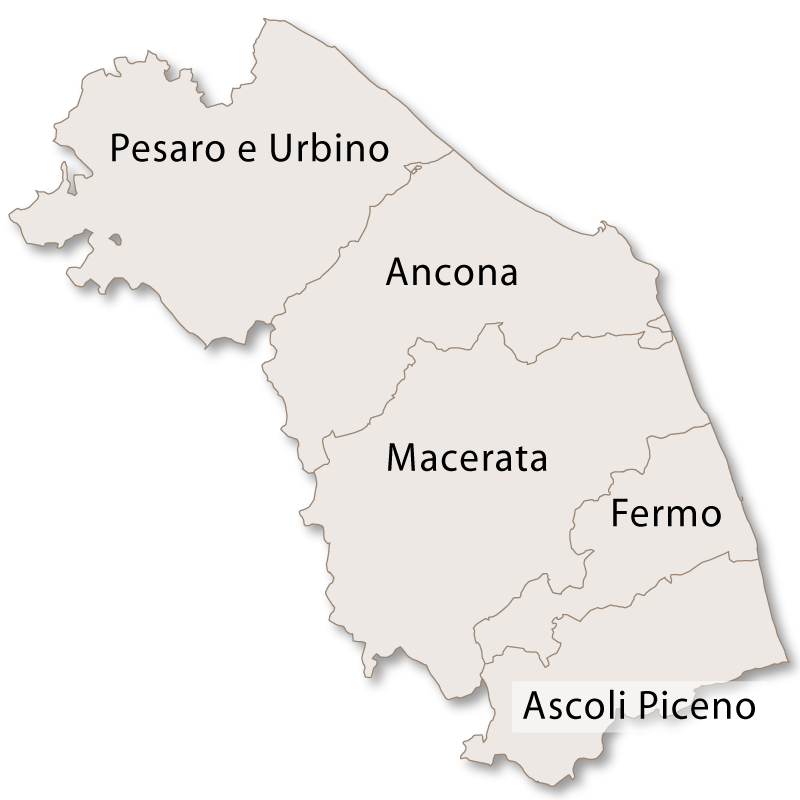 Pesaro Pesaro is the capital of this province, with Urbino being the second city. Pesaro is a coastal town and elegant holiday destination with a thriving fishing port. 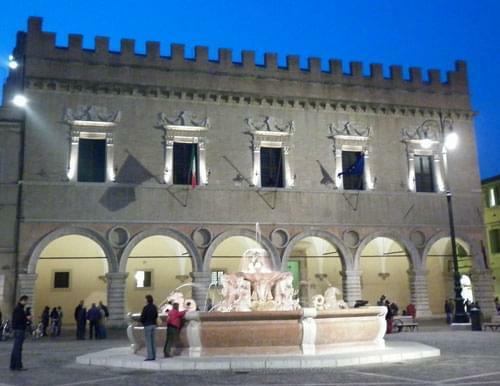 The social centre of the Pesaro is the main square, Piazza del Popolo, which is full of people, bars, geletarias, restaurants and everything needed for an authentic Italian holiday. The streets around the city are broad and attractive with many beautiful buildings of historical and architectural interest. This Romanesque cathedral was built in the 5th century and has an unfinished façade built in the Romanesque-Gothic style. During recent restoration works a set of precious floor mosaics were uncovered. Constructed during the latter half of the 15th century, it has six arches supported by heavy pillars and an upper floor with five, heavily decorated windows. Built in the 15th century it was later used as a prison. It is square with a round tower in each corner and has a wide moat which is now dry. Built around 1530 for Duke Francesco Maria Della Rovere, the villa sits on top of the hill of San Bartolo. It has a sunken courtyard and its rooms are decorated by renowned artist. A good example of Baroque architecture, built in the 18th century. This church has an impressive Gothic portal. There are a couple of good museums; The Town Museum and The Oliveriani Museum which has some interesting archaeological findings. This is the third largest indoor arena in Italy, the first and second being in Milan and Rome. This film festival has been taking place in Pesaro since 1965. The composer, Gioachino Antonio Rossini, was born in Pesaro in 1792 and ever since 1980 the Rossini Opera Festival takes place every summer. The city is also home to the 'Conservatorio Statale di Musica Gioachino Rossini' which was founded with a legacy from the late composer. 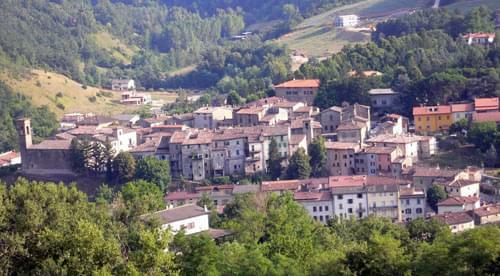 His birthplace can be found at 34 Via Rossini and there is a museum there which is dedicated to him. Another famous person who was born and bought up in the city of Pesaro is Valentino Rossi, the motorcycle racer. Urbino is a picturesque, well preserved, walled medieval city located on the slopes of one of the foothills of the Northern Apennines. It is a university town (University of Urbino) and is also a national heritage site due to its rich history and examples of architecture. The Palazzo Ducale is a Renaissance building and one of the most important architectural monuments in Italy and is a UNESCO World Heritage Site. The Palazzo Ducale (Ducal Palace) was built in the middle of the 15th century for Duke Federico III da Montefeltro and was designed by Maso di Bartolomeo. It houses the Galleria Nazionale delle Marche (National Gallery of the Marche) which has one of the most important collections of Renaissance art in the world. There are three other notable palaces in Urbino, Palazzo Albani, Palazzo Odasi and Palazzo Passionei. Duomo di Urbino (Urbino Cathedral) - the building of the cathedral originally started in 1021 over the remains of a 6th century religious edifice. After many alterations, renovations and changes of design it was finally finished in 1604 only to be destroyed by an earthquake in 1789. The cathedral was rebuilt in a Neoclassical style and was finished in 1801. Albornoz Fortress (known locally as La Fortezza), was built in the 14th century and when the Della Rovere added a new series of walls to the city in the early 16th century the rock was enclosed in them. It is now a public park. Other churches with historical and architectural interest are San Giovanni Battista, Sant'Agostino, San Francesco and The Oratory of San Giuseppe. Raphael was born in Urbina and his house, which is still standing, has become a shrine and museum. There is also a nice Botanical Garden, called Pierina Scaramella, which is maintained by the University of Urbino. It has some interesting medicinal plants and can be found in Via Bramante. Acqualagna - Parish church, with traces of 15th-16th century frescoes. Pelingo Sanctuary - San Vincenzo al Furlo, what remains of a 7th-century abbey in which resided St. Romuald (1011) and Pier Damiani (1042). The current church, in Romanesque style, was founded by abbot Bonaventura in 1271. The crypt has ancient columns and a 9th-10th century altar. Furlo Gorge: one of the most spectacular gorges in Italy, with a 2000-year-old Roman tunnel. Pietralata Sanctuary: nestled in the hills adjoining to the gorge lays this wonderful restored small monastery. The Campanone (Big Bell), a bell tower with a clock dating back to the 15th century. Palazzo Ubaldini which dates from the 15th century and has a notable courtyard with Ionic-style columns. It houses a fossil and minerals museum and was originally designed by Francesco di Giorgio Martini. Church of Madonna della Vita which houses a 15th-century wooden crucifix. 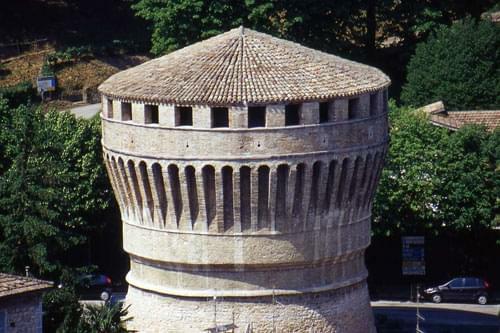 Appecchio also has a good example of a Medieval Bridge, an interesting Jewish Quarter and is also home to the Globe of Peace, which was, until 1999, the world's largest rotating globe. This small town is full of history and as well as being a pleasant place to stay or visit it has some very interesting sites. Rocca Torrione - a fortified complex(find another phrase) built in 1481 for Duke Federico III da Montefeltro. The rooms in this tower have been used, since 1989, to host exhibitions of specially commissioned sculptures by the Centre for Contemporary Sculpture. Church of San Francesco - dating back to 1234. Church of Santa Maria della Misericordia - the 1537 portal has a fresco of the Madonna della Misericordia above it. Church of Sant'Angelo Minore - it has a 17th century alter which is very elaborate with gilded and lacquered wood and vast columns. Town Hall - built in the 13th century to house the governors of the city and is both elaborate and interesting internally. Concattedrale di S. Maria Assunta- a medieval cathedral with a gothic portal. It was badly damaged in 1781 by an earthquake and was renovated but with a more rounded dome to replace the original taller dome. Church of San Domenico - built by the Celestines, who were a branch of the Benedictine monks and has some 14th century frescoes. Ponte Mallio - a bridge dating back to the Roman Republican times (220 BC and is one of the most imposing Roman remains along the ancient consular road, the via Flaminia. The bridge was built using large blocks (some larger than a cubic meter), all of which were put into place without any mortar. Municipal theatre, opened in 1878 and designed by Giovanni Santini. The city and its environs abound in antiquities, especially inscriptions. Noteworthy remains are the statue of the god Vertumnus; the Furlo Pass, constructed by the Emperor Vespasian to shorten the passage of that mountain; and the bridge of Trajan (115) near Calmazzo, and that of Diocletian (292), both over the Metaurus. Church of Sant'Agostino (14th century, enlarged in the 18th century). It has a hut-like facade with the coat of arms of the House of Malatesta. The interior houses a canvas by Federico Zuccari. Ducal Palace, accredited to Francesco di Giorgio Martini and Girolamo Genga and built for Cardinal Giuliano della Rovere, brother of the Duke Guidobaldo II. The Renaissance court and the Cardinal's chapel are both noteworthy. The 16th century Corte Bassa, a residence of the Dukes of Urbino, which has a notable Renaissance façade and pavement. Palazzo Vescovile – the Bishop's Palace which was built in 1479 and has a Renaissance façade with a portico and a Crucifixion fresco attributed to Bartolomeo di Gentile (1493). Pieve Collegiata which was rebuilt in 1363 but has walls from the 10th century. Gothic church of St. Francis (13th century), with a remarkable collection of paintings from the 12th-17th centuries. Ducal Palace (15th century), also attributed to Francesco di Giorgio Matrini. The major tourist attraction in Mondavio is the medieval castle, designed by Francesco di Giorgio Martini, and built between 1482 and 1492. The design is unusual and the castle is remarkable for the fact that it is still largely intact. 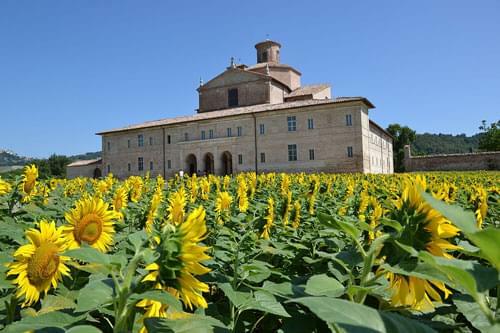 This small town is home to the Fonte Avellana which is a Roman Catholic hermitage which was established by a group of hermits living at the site around the turn of the first millennium. The cells of the hermits living there were all built as suites which meant that each hermit could share a cell with his disciple but each could have their own sleeping quarters. Ducal Palace, housing a museum and a library with globes made by the Flemish-born, German natural scientist Gerardus Mercator between 1541 and 1551. Chiesa dei Morti (Church of the Dead), with 18 natural mummies from the Middle Ages and the Renaissance openly displayed behind the altar. 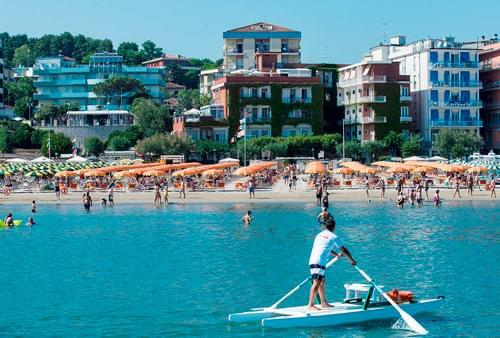 Gabicce Mare is a small fishing port with a long sandy beach for which it regularly receives the Blue Flag award. A delightful resort much frequented by Italians with some French and German visitors but as yet few English. Gabicce Mare is a lively but sophisticated resort with much to recommend it. Known as Fanum Fortunae in Roman times the city today is a fairly well-known coastal resort and one of the most important Adriatic fishing ports. Fano is a tourist destination for those looking for quality of life, with first rate cultural, historical and environmental heritage. 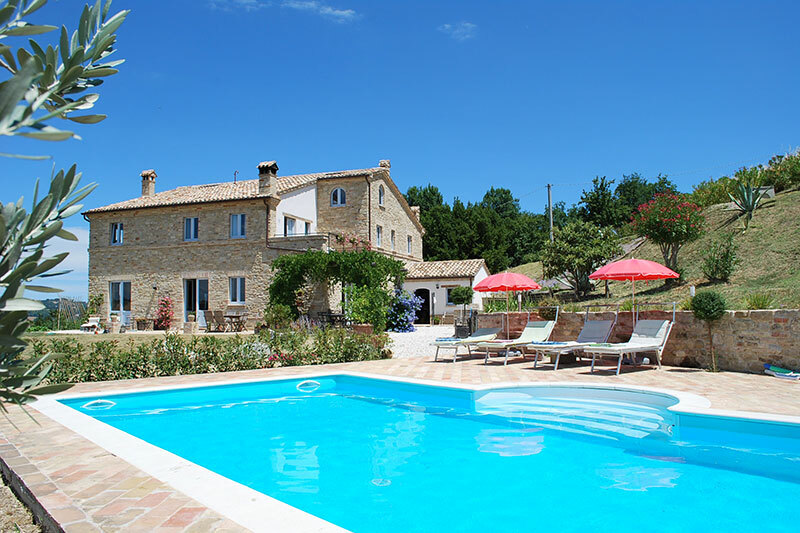 Visitors wanting a more tranquil holiday are able to stay in the delightful hilly countryside and still be within a few kilometers of the sea. The port divides the coast of Fano into two, with Sassonia beach to the east and the sandy Lido to the west. A number of other wide beaches and small bays are to be found along the coast on both sides of the town at Fosso Sejore, Metaurilia, Torrette and Marotta and provide welcoming natural environments the tourist. 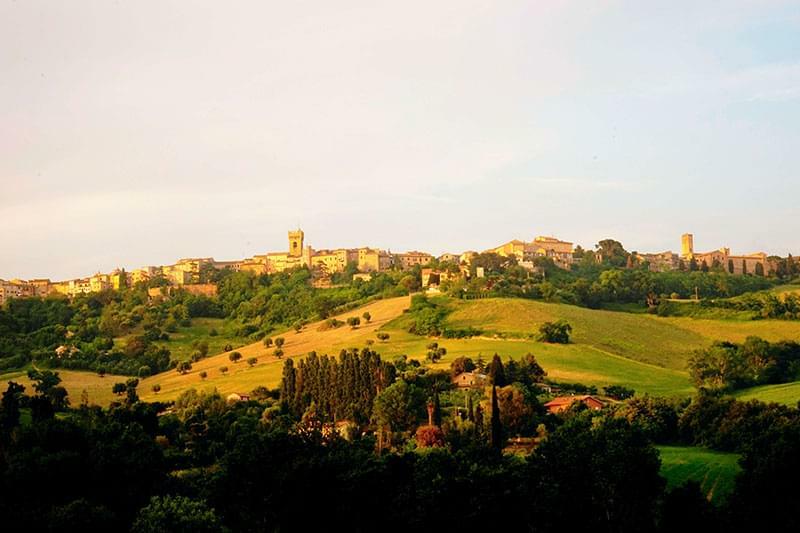 The gently rolling hills in the Province of Pesaro and Urbino have very fertile soil and the countryside, along with a mild climate, is perfect for growing high quality grapes. 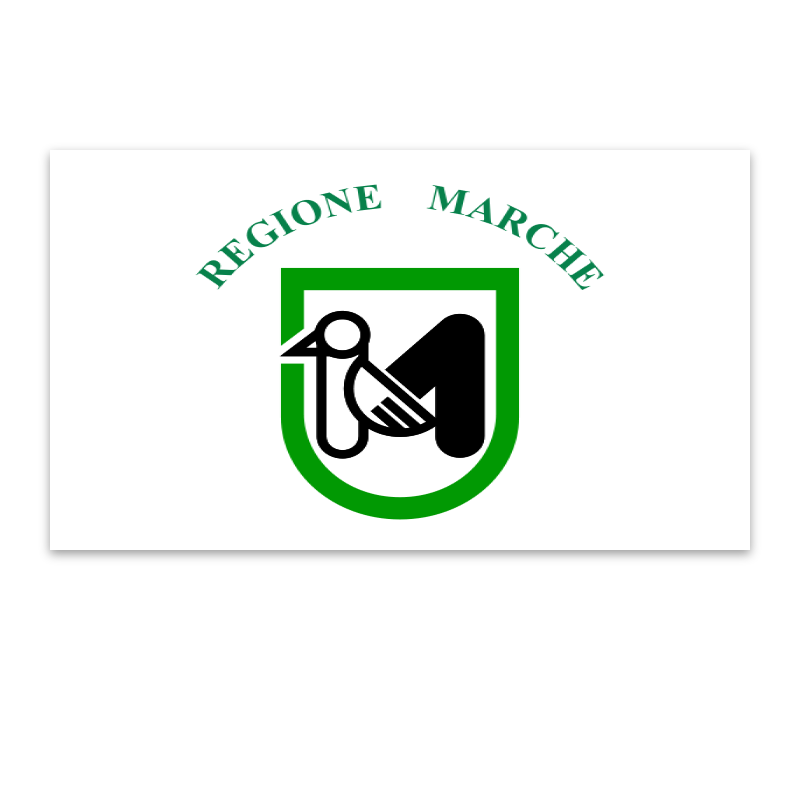 Some excellent wines are produced in this province of Le Marche and the three best DOC classified wines from the area are Colli Pesaresi Rosso, Colli Pesaresi Bianco and Bianchello del Metauro. Inland a traditional wild cherry wine is produced (Visner) by maturing the cherries and the wine together. Olives are grown just outside Fano and olive oil production is still quite big business in the province. Truffles also grow well here and again, just outside Fano is a village called Acqualagna which is one of the largest truffle producing areas in Italy. There are many delicious cheeses made in this province including Casciotta di Urbino, Pecorino con le Vinacce and Pecorino di Botte which is wrapped in a particular blend of foliage giving it an unusual but delicate flavour. Undoubtedly the most famous cheese of the province of Pesaro and Urbino is the golden Formaggio di Fossa which is matured in underground caves of tufa stone. This cheese is produced mainly in the north of the province in Val Marecchia area but can be found elsewhere. Fish is prominent on the menu here as the Adriatic Sea is one of the richest fishing areas and most of the local delicacies are fish based.